Bell's (40.0%): Last week I had a chance to take a three days break from the New England Snowpocalype and managed to fly to London for some meetings. Last night I finally had some time to sneak out by myself for a wee pub crawl in Mayfair area (well, not the best neighborhood for a pub crawl, but...) where my hotel was located. It was so great to have a few pints of nice cask ales accompanied by a couple of drams of Bell's and chat with the locals. Next morning on my way back to home I grabbed a bottle of Bell's at Heathrow Airport for my ongoing Blend Project. Bell's is one of my go to blends in England. It is cheap, dependable, pairs great with British ales and almost every pub has a bottle waiting for you. 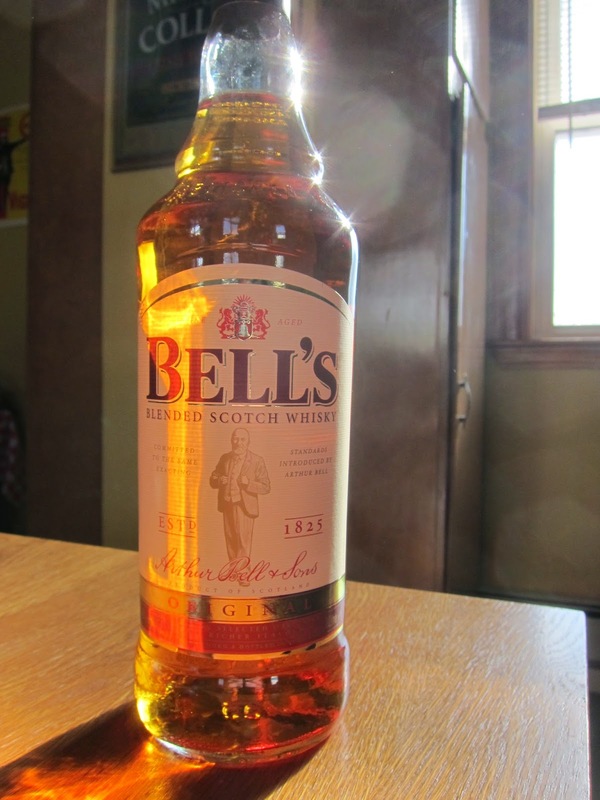 The whisky was first blended by a gentleman called Arthur Bell in 1851 in Perth, Scotland. Soon his sons took over the business and formed the company Arthur Bell & Sons Ltd. They also added Blair Athol and Dufftown distilleries to their portfolio in 20th century. After becoming the best selling whisky in UK in 1970s by a large margin the company got sold to Guinness in 1985 and then eventually became a part of Diageo. It is still the highest selling whisky in UK. Blair Athol is the major component in Bell's but the recipe contains whiskies from Dufftown, Inchgower, Glenkinchie and Caol Ila distilleries as well. Color: Polished copper, medium amber. Nose: Soft, buttery and vegetal. Blondie cookie dough, fresh green asparagus and cornflakes. Subtle peat, honey syrup and fruit cake. Quite enjoyable nose for a low shelf blend. It is grainy indeed but in a good way. Challah bread, fresh mint and sea breeze. Palate: Allspice, furniture polish and charcoal. Sea salt, sweet banana peppers and butter cookies. It gets pretty malty but lacks a little bit in texture. Belgian beer yeast, green walnuts, banana cream pie and hint of anise. Finish: Short. Dried fruit and soot. I have to admit it makes you take another sip right away though. Overall: Yeah, I know I am a sucker for cheap blends but Bell's is definitely a good one. Every promise fulfilled for 25 bucks/1 liter. It's a great candidate for the top five of my blend project and I can pretty much guarantee that this bottle won't last too long in this household.